The Affordable Care Act (ACA), signed on March 23, 2010, by President Barack Obama, has often been described as legislation to 1) make healthcare and health insurance more affordable, and 2) make health insurance more broadly available to Americans. Key parts of the ACA have been discussed relentlessly in the market, in particular the requirements that people with preexisting conditions can’t be charged more or denied treatment, and the requirement that all Americans must have healthcare or face a tax penalty. While the new rules imposed on the healthcare industry have served to increase accessibility, what has the impact been with respect to affordability? In this two-part series, we will look at the impact of this legislation, first from the perspective of accessibility and whether enrollment has actually increased since the ACA was introduced, and then at affordability, or costs, and how overall costs in the individual market have been increasing. We will use the S&P Healthcare Claims Indices to evaluate the success of each provision further. Accessibility: Do More Americans Have Healthcare Coverage Today Than When the ACA Was Introduced in 2010? 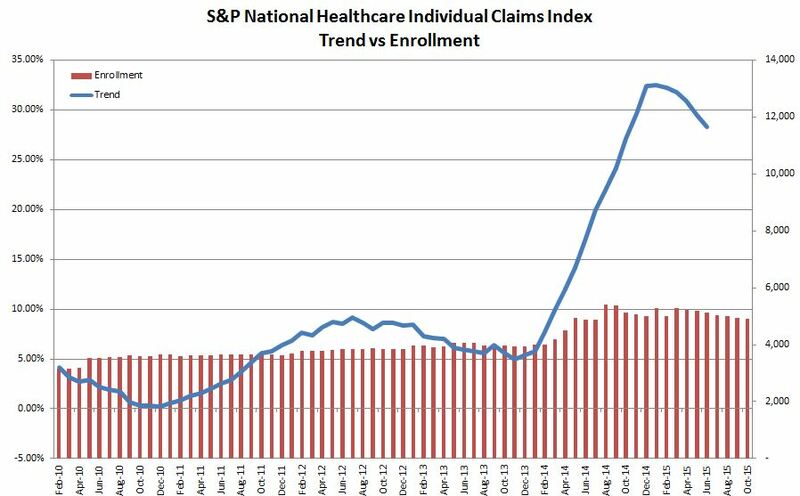 According to the S&P National Healthcare Individual Claims Index, there appears to be strong evidence that there has been an increase in private enrollment since the introduction of the ACA. The majority of this increase occurred concurrent with the introduction of the Health Insurance Marketplace in January 2014. Because the initial open enrollment in the Health Insurance Marketplace was plagued with administrative problems, growth in enrollment was delayed. In fact, in early 2014, the government announced that open enrollment would be extended to March 31, 2014. As can be seen in Exhibit 1, individuals started to take advantage of this new coverage, and between October 2013 and September 2015, total enrollment increased by over 25% on an adjusted basis, as measured by the S&P Healthcare Claims Indices for the individual market. Given that the S&P Healthcare Claims Indices represent approximately 40% of the total commercial healthcare market in the U.S., we believe that it is reasonable to conclude that the ACA has induced more individuals to buy individual health coverage. Also notable in Exhibit 1 is an increase in the cost trend from 5% annual to over 30% in 2014 on a 12-month basis, indicating that these additional enrollees had a significant impact on costs. In part 2 next week, we will look deeper into the impact on costs that the additional enrollment had. The enrollment numbers have been adjusted to remove the drop in enrollment due to the removal of a plan from the S&P Healthcare Indices in October 2014.